I attempt to make healthy granola bars. I enlist C’s help. This results. I’m pretty good at accepting myself as a work-in-progress, but if there is one thing I could change about myself (other than my 27 inch inseam), I would become a morning person. Because on days like today, where I roll over and waste two brilliant hours of sunshine, I get a little short with myself. Pun intended. Even with the two lost hours, I still managed to finagle the best kind of Sunday: one that is both peaceful and productive. Colby returned from his father’s later than we planned, so I tidied up, drank coffee, watched Meet The Press and started my Statistics homework. He came home, we visited briefly, and he played music while I finished up. He stacked wood and I prepped the kitchen for a little creative culinary endeavor – homemade granola bars. Said endeavor lasted upwards of three hours and ended with a sink and dishwasher full of dirty dishes, about 4,000 jokes about me saying “OK, Colby. 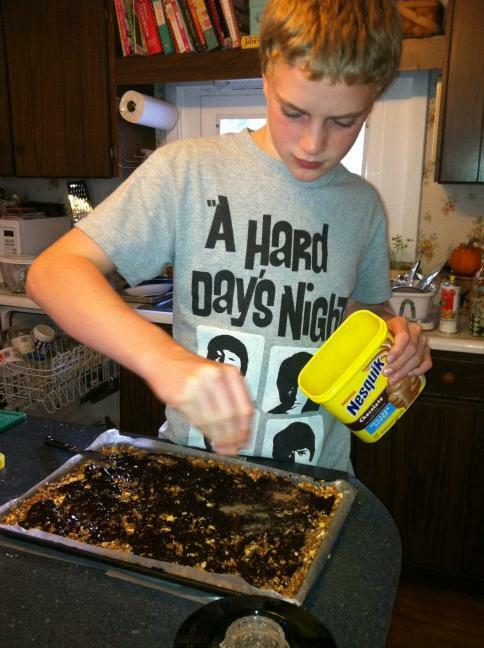 Now you need to process your nuts”, and Colby saving a chocolate glaze that turned. He then used the leftovers to craft what, at best, would be a spicy chocolate drink and at worst, a science experiment gone wrong. Matt was the only one brave enough to try it and, well, you remember that post about bravery, right? I went for a run in that last afternoon blast of sunlight while Colby and Matt finished stacking wood. I came home, showered, and Colby and I went to the 6 p.m. student mass. When we returned, I began my quiz while Matt finished dinner. We ate, I finished my quiz (and passed! phew!) while listening for juicy plot tidbits from Once Upon a Time playing in the next room. Now, I am having a glass of wine with you! Doesn’t that sound like the product of a well-oiled machine? Am I the redneck incarnation of Martha? No. It’s a fluke, believe me, but I am oh-so-grateful for it. Previous Post Rebels. Out on a school night.